This is our basic conference meeting room, setup for smaller meetings of up to 4 people. 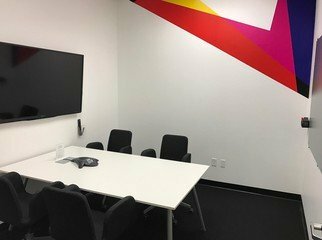 This room features a landline for conference calls, a monitor, a dry erase board, and an Apple TV allowing for easy connectivity for presentations. - Every room is conference call capable. - Every room is equipped with courtesy WiFi. - Our rooms come equipped with projectors, monitors, Apple TVs, and dry erase boards. - We have the HDMI converter cables to cover any hookup for presentations. - We have premium coffee brewed in the front lobby to greet you and your guests. - Access to a reach in filled with refreshments. Ask about our priority conference room services! For complete details and to schedule tours, just message us. - All booking start and end times are inclusive of set up and clean up time. - You may arrive up to 15 minutes to get acquainted with the space. - If rooms are not sufficiently cleaned up after your departure, we may bill you an additional $25 clean up fee.